This is an excellent theater season in Chicago. Both the mainstream and storefront theaters are doing interesting new plays and presenting inventive takes on old material. And there’s always the bizarre and quirky film to talk about, for instance…. This Must Be the Place. This is an extraordinarily rewarding film if I can interest you in the plot and the techniques – and if you can tolerate ambiguity. It’s written and directed by the Italian Paolo Sorrentino. 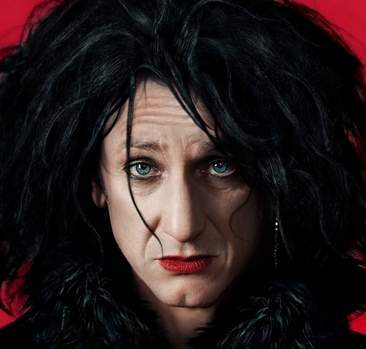 Sean Penn stars as Cheyenne, a rich rock star, retired in Dublin, who seems to have lost interest in life and has nothing to think about except when to sell his 30,000 shares of Tesco. His wife of 35 years, played by Frances McDormand, is charming and vital and totally in love with him. Penn, by the way, throughout most of the film, is made up with the bizarre red, black and white makeup and long black messy hair patterned after Robert Smith of the Cure. And one plot element (two teenagers commit suicide, perhaps because of the depressing lyrics of Cheyenne’s songs) is also patterned after Smith’s career. Sorrentino’s direction has a lot of jump cuts and oddly composed scenes but the cinematography is beautiful and his dialogue is often poetic and intense. Penn is brilliant as Cheyenne; he has totally remade himself and his voice to become the depressed aging performer. The film was released in 2011 and was recently released on DVD. I watched it twice. You might too. The Birthday Party. This early play by Harold Pinter is now at Steppenwolf Theatre and I was pleasantly surprised by how good it was. It’s not that I don’t like Pinter. But early reviews were mostly negative and I had heard from two acquaintances that it was “terrible.” Maybe it improved since opening night. I thought it was well paced and had some good performances, two of them appropriately menacing. The scary birthday party has disastrous consequences … and a Pinteresque ambiguous ending. The play is in three acts and (unusual for me) did not seem too long. I usually think everything needs editing but this party did not. The cast is directed by Austin Pendleton and made up of some fine Chicago actors including John Mahoney, Francis Guinan, Marc Grapey (don’t miss his clever bio in the playbill), Ian Barford, Moira Harris, and her daughter, Sophia Sinise. It’s a play where everything is not always what it seems, which makes it gripping from beginning to end. The Birthday Party runs thru April 18. 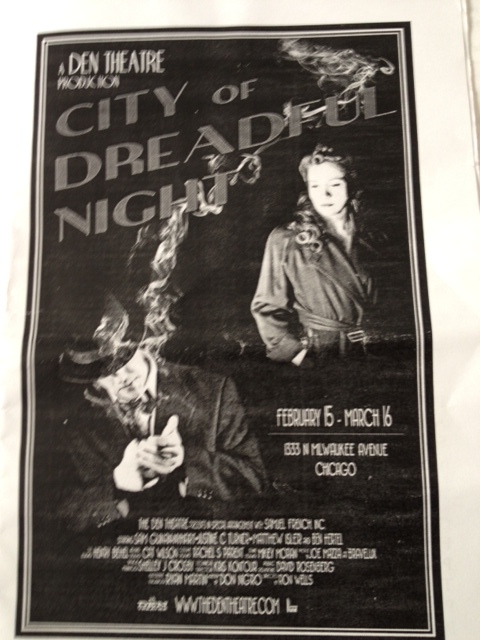 City of Dreadful Night is a four-character thriller by Don Nigro. It’s set during the Cold War and the four characters end the play sitting in a diner that resembles the scene in Edward Hopper’s painting, Nighthawks. (See that at the Art Institute of Chicago. Nigro has written about 300 plays, several of them about or inspired by artists and their paintings.) Brisk dialogue, a bit Mametesque, and good acting. It’s a 90-minute one act that moves along briskly. Julius Caesar is the current play at Chicago Shakespeare. It’s not my favorite Shakespeare but I liked the visual style and setting of this production. It’s a contemporary political drama – that’s probably an irresistible approach for a director and serves to demonstrate how Shakespeare can explore human character flaws in any era. Before the play starts, the scene is the Roman Forum, populated by sellers of hot dogs and political buttons, Roman citizens taking photos with their smartphones, and a banner promoting Julius Caesar’s website: www.caesarforall.com. The play is well acted and its scenes of strife bring life to the conspiracy against Caesar. Julius Caesar runs through March 24. See it if for its visually stunning presentation and reminders of how political conspiracy can infect the body politic. I know most people were at the concert to see the marvelous Emmylou. She was fine and her songs with Crowell were well done. But I was there to see Richard Thompson Electric. And he was. What’s next on Nancy’s calendar? Concerning Strange Devices from the Distant West at Timeline Theatre, Coriolanus at The Hypocrites, and an overview of the Picasso and Chicago exhibit at the Art Institute. I’m going to see Julius Caesar Saturday; we can compare notes. This message contains information that is confidential and is exempt from disclosure under applicable law and is intended only for the use of the individual to which it is addressed. If the reader of this is not the intended, you are hereby notified that copying or dissemination of this communication is strictly prohibited. If you have received this message in error, please notify us immediately by telephone. Nancy, I am enjoying reading these reviews…thanks for sharing! Thanks, D. I’m hoping they will convince you to make a Chicago trip! Your highly informative and entertaining blog really makes me hope that I can find a job when I return to Chicago that will allow me to partake of your many cultural offerings. I love reading your dispatches. Thanks for the good words. This is a WordPress theme called “Clean Home.” I did it myself with very little customizing except adding some widgets. The free version of WordPress has lots of themes. You can create some of your own content and see how it will look in each theme.